Sticking to its legendary heritage Google again outdid everyone on the market at their Google Marketing Live event this year. One particular thing which stood out from the many new ad features and tools that could transform the game altogether was Responsive Ads. Here are few key points to shed light on these Responsive ads. 1. What are Responsive Ads? Responsive Search Ads go beyond the traditional search ads as they contain multiple descriptions and headlines, and thousands of Combinations of them; all of which get tested out by Google to see which one performs the best. Such ad testing and analysis help to maximize the chances of delivering the most suited Ad to the user based on their search term, device they are using, as well as the past browsing behavior. 2. How are they different from Expanded Text Ads? Description Length: Two descriptions of 90 Characters each instead of 80 character limit in Expanded Text Ads. Flexibility and Testing: Similar to multiple headlines in UAC campaigns but much more than them. It can be provided up to 15 Headlines and up to 4 Descriptions, but a max of 3 headlines and 2 descriptions can be shown at a time. 3. How Do I Create Responsive Search Ads in Google Ads? Responsive Search Ads were recently announced and are still in the beta stages and their creation is limited to a few user accounts. We may expect them to be available to all advertisers soon. The next step would require us to create the different components of Responsive Search Ad- headlines, final URL and display the URL path field. The final step includes saving the new add by clicking the button. 4. How Do Google’s Responsive Search Ads Perform? Responsive Search Ads perform better as compared to Expanded Text Ads. Statistically, they carry 10-20% higher CTR compared to standard search ads. We cannot solely rely on the numbers so it’s safer to follow the best practices to maximize the performance of your Responsive Search Ad. Every Responsive Search Ad needs to have at least 3 headlines and 2 descriptions to show. To capitalize on its enormous potential try providing system more options to test, learn and deliver the best possible results. Responsive Search Ads allow up to 15 headlines and 4 descriptions. Avoid repetitive variants of the same headline. Google actually won’t even show our Responsive Search Ad if the headlines, descriptions are too similar. Idea is to highlight different value propositions, offers, and add a call to action (CTA) to each element of your responsive search ad. Always ensure to insert top keywords in at least 2 of your Headlines. Use Dynamic Keyword Insertion to insert your Keywords into Responsive Search Ads. At least 3 headlines (without your keywords) will prevent your ads from becoming overly repetitive and allow Google to highlight more value to searchers. Try having headlines & descriptions of different lengths. This will increase the number of combinations. A good Responsive Search Ads has multiple stand-out messages which combine perfectly. Don’t have repetitive messages or call for action. 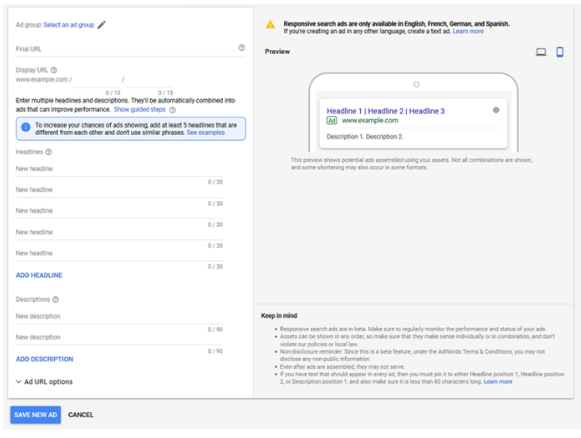 Google’s Responsive Search Ads will automatically test different headlines in different positions to see how they perform in headline 1, 2, and 3. Every Headline won’t appear each time, same stands for Descriptions. This allows Google to improvise and fine-tune the message to custom fit each user, search term and their devices. To pin that all-important headline, hover over to the right of that headline and a pin icon will appear. Clicking the icon will give us several different options to make sure your headline “always shows”. Similar is the case for descriptions. 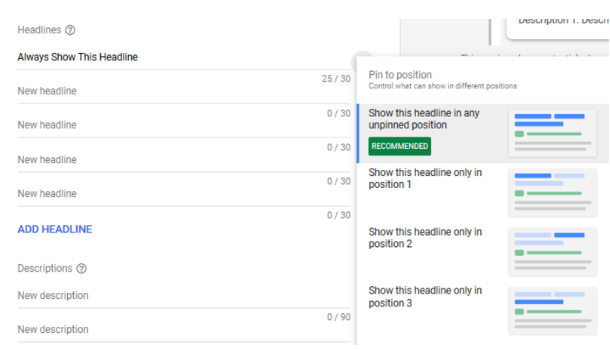 We can also pin the message at a particular place by specifying that; “Showing this headline in any unpinned position” would ensure that the message always appears, whatsoever may be the position; 1,2 or 3. 8. Pin only in case of Hard Brand Guidelines! It’s not recommended to use pinning option as it interferes with the Google’s automatic variant testing, and would negatively impact your output. Pinning more than 1 headline deceives whole idea of Responsive Search ads and it makes it equivalent to Expanded text ad. 9. One Responsive Search Ad is enough! 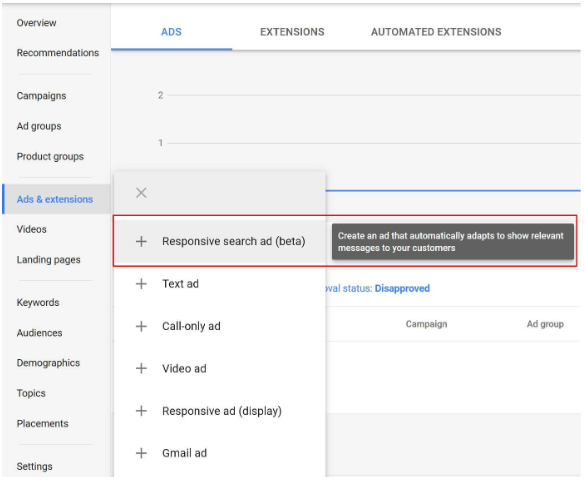 Google automatically tests different elements of our Responsive Search Ads against one another, eliminating the need to include multiple Responsive Search Ads in the same ad group. (Similar to Dynamic Asset of Facebook) Rather, multiple ads can prevent them from testing different variants and will slow down the optimization of our Responsive Search Ads.